It looks like this will be our last fall color report for 2012…Frankenstorm arrived in the mountains of Western North Carolina earlier this week and blew many of the leaves to the ground at our elevation (2,300 feet). We had some really strong wind gusts as a result of Hurricane Sandy and the winter storm system that decided to overlap and bring crazy weather to the Eastern U.S., but we were fortunate and only lost two apple trees and our power and phone service for the day. Our guests and innkeeper friends who live in areas affected by this week’s weather are foremost in our thoughts — hope everyone came through the storm OK! 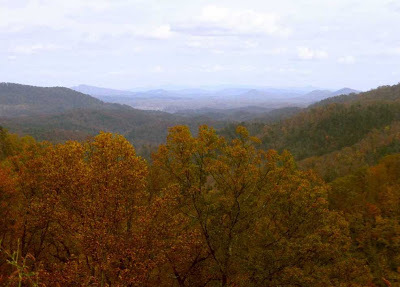 As for the 2012 fall foliage season in the North Carolina mountains, we were impressed with the brightness of the colors this fall, as well as the variation in colors that occurred later in the season. If you’re coming to our neck of the woods the first part of November, there are still opportunities to see fall foliage. 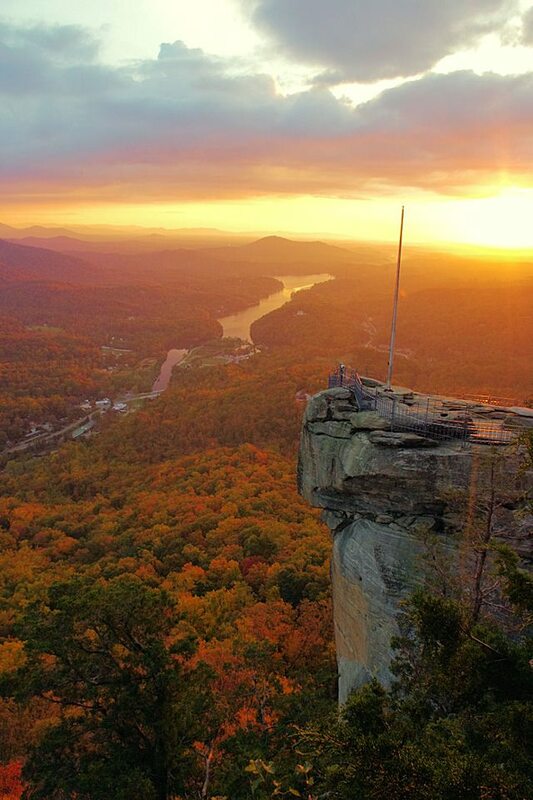 One such place is Chimney Rock State Park, just 30 minutes south of the Inn on Mill Creek. Their fall foliage typically peaks in late October/early November. And due to the mountains having decent rainfall this year, the Hickory Nut Falls at the park have been pretty amazing. 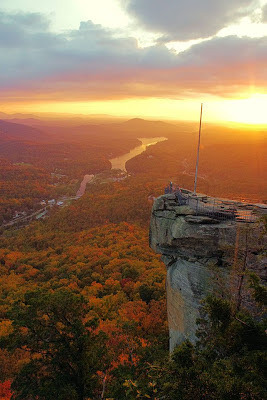 Check out this photo from RomanticAsheville.com of sunrise over Chimney Rock on October 26! the park and see views of Hickory Nut Gorge that surrounds Chimney Rock. Chimney or head up the Outcroppings Trail, which is a set of stairs.